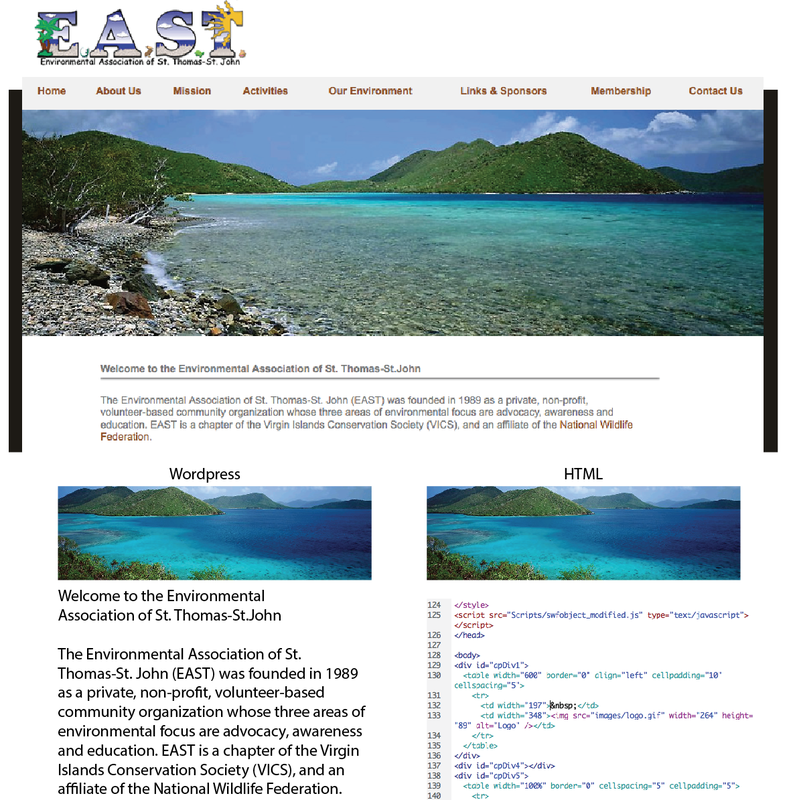 For many years I developed websites for clients in pure html. It was time consuming and needed a very specialized skill set to design, code, and maintain these sites—which works fine for the type of clients I used to have: universities, large nonprofits, and corporations. They actually budget for web departments or services, and they need to, using html. WordPress is a unique content management system that is so user friendly—it’s the only thing I recommend to my author clients. WordPress used to be just a fabulous blog software, but for the last few years it’s also been an all around go-to development tool. The backend of WordPress uses a code called PHP. You can still use your html skills, but now it’s backed up by a powerful mySQL database. That might sound like techie-talk but what it means is that WordPress is state of the art. And with over 409 million people reading WordPress blogs every month, it’s a good thing it’s also backed up by the world’s leading coders and developers. The numbers aren’t shrinking; it’s a sound choice. My clients tend to be authors AND bloggers. WordPress allows you to access the “guts” of your website (pages and posts) through a web browser. To add images, just drag and drop. Ready to blog? Open a new post and start typing. You get the idea. If you aren’t sold yet, tune in here and over the next few months. I’ll go into detail about setting up and maintaining your own WordPress website. Click on the image below to see the difference in creating a page in wordpress or creating a page in html. I’ve blogged before. The sort of blog that is more stream of consciousness rather than helpful to anyone. 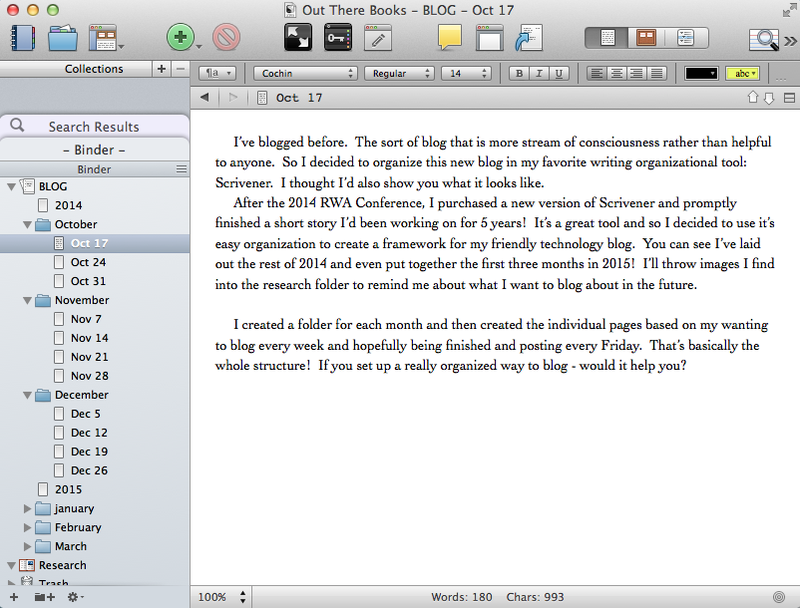 So I decided to organize this new blog in my favorite writing organizational tool: Scrivener. I thought I’d also show you what it looks like. After the 2014 RWA Conference, I purchased a new version of Scrivener and promptly finished a short story I’d been working on for 5 years! It’s a great tool and so I decided to use its easy organization to create a framework for my friendly technology blog. You can see I’ve laid out the rest of 2014 and even put together the first three months in 2015! I’ll throw images I find into the research folder to remind me about what I want to blog about in the future. I created a folder for each month and then created the individual pages based on my wanting to blog every week and hopefully being finished and posting every Friday. That’s basically the whole structure! If you set up a really organized way to blog, would it help you?